Classy is the only way to describe this black faux leather game chair. This design truly mastered the classic look of a formal game room with the rich, chestnut finish used on the exposed wood arms, back and base. The thick wood is lightly decorated with a ribbed design. 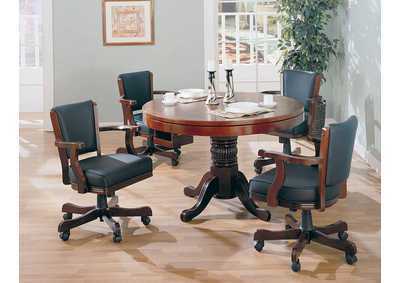 Four casters make this chair easy to move.